Looking for a strong and simple latching system that you can either screw or weld on. 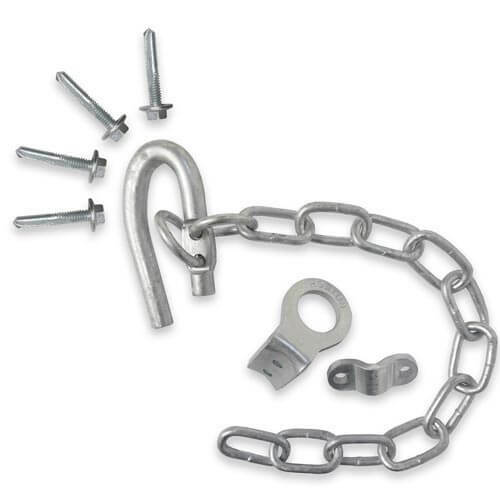 Our complete chain latch kit is an easy solution to securing your chain onto a gate post. Are you frustrated with looping your chain around your fence post in order to secure your gate? If you have a barb wire fence, I'm sure you have experienced getting snagged at least once when trying to close your gate. Our zinc plated chain latch kit allows you to simply latch your gate on to any wooden or steel post. Available with a standard or spring hook, you can either weld or screw your kit to the gate. This allows you to loop your chain around your gate, rather than the fence post.